I have been a vegetarian for about 6.5 years. I probably would have been one earlier, since it had become such a fad, but I personally hate to do anything because it’s a fad, so I had to find my own reasons. And the more I learned about the environmental impact of meat, the amount of energy it takes to produce 1 kg of meat, and the really horrid conditions of factory-raised meat animals, the easier it was for me to make that decision. And not being able to afford locally and ethically raised meats, vegetarianism was the clear choice. That being said, the more I got into farming and sustainable food systems, I knew that eventually the question would come up again. I believe that a sustainable farm needs animals on it, to help with soil fertility, pest management, and farmer happiness. And the reality is, it’s not economically feasible to have non-productive animals on a farm, so animals need to have other purposes, whether it is dairy or egg production, or meat. I understand this, and feel myself on secure moral and environmental grounds to say that local, ethical and sustainably raised meat is an important part of a sustainable food system. So, having spent the summer on a small-scale organic farm, raising pigs and lambs for meat, and chickens for eggs, I took on a project for myself. Turkeys! When I became a vegetarian, one thing I really missed was eating turkey at Thanksgiving and Christmas, which has much more to do with the traditions and family than it actually does about eating turkey. And since I know that every year, my family will eat a turkey at these holidays, my thought is that if I can raise these turkeys myself in a way that I agree with, then I will have no problem eating them come the holidays. So I proposed to raise 2 turkeys at Rootdown this summer, from chick to table. A bit later than would have been ideal, we got our chicks towards the end of June. Because we were only getting 2, we piggy-backed onto a neighbour’s order. The turkeys were your typical white meat birds, not a heritage breed. Chicks are hatched in hatcheries, in this case one in Alberta, and are shipped in boxes. Because a chick ingests the remaining egg yolk just before hatching, they can survive for up to 2 days without food and water, allowing them to be shipped in boxes. Certainly, in a lot of cases, a few will die in transit, but in our case, the chicks arrived in good health. Never having raised any kind of poultry before, I tried to prepare with lots of reading, and I was very nervous. I set up a small pen with cardboard walls, straw floor and a heat lamp. I worried that they wouldn’t be able to eat or drink, because many things I’d read said turkey chicks are pretty dumb, and sometimes can’t figure out how to eat and drink, but these guys did fine right from the start. 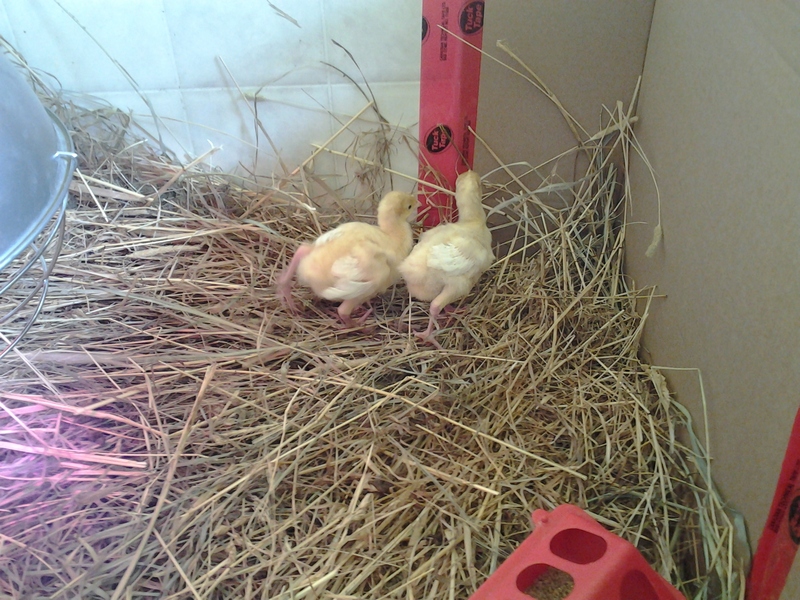 They made little panicky cheeping sounds when I would go in to look at them, so mostly I left them alone. 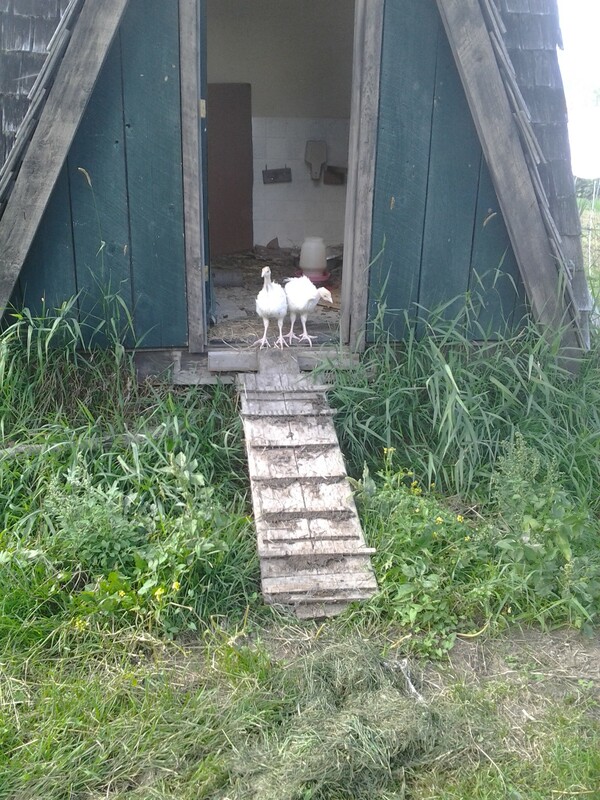 As the weeks went by, the turkey chicks grew bigger, and after a few weeks, we opened the doors to the house during the day so they could access a fenced-in pasture. They were so nervous at first! But they quickly grew to love being outdoors, so much so that most nights, I had to physically chase them back into their house for the night – not as bright as chickens, who will go in on their own. The turkeys provided their share of entertainment at the farm. 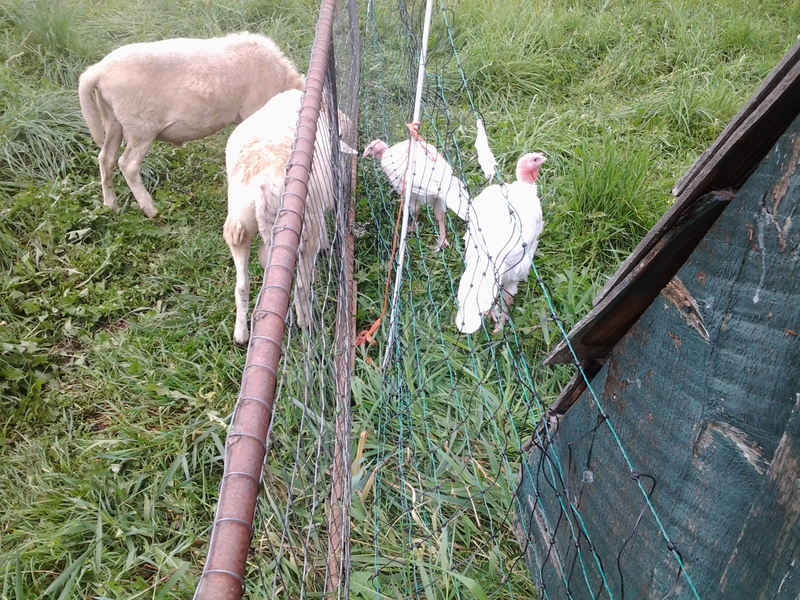 When the 2 lambs, whose fenced pen was moved every couple of days to new grass, ended up next to the turkey pen, they all seemed to recognize some kind of friendship between them, and they would greet each other through their fences. The turkeys continued to grow happily throughout the summer without incident. Then, one day when I was over at a neighbouring farm for the day, the smaller of the turkeys was found dead in the house in the morning. We had no idea what had happened, but from discussions with other farmers, this is not an uncommon occurrence. In fact, two of the other people who had raised chicks from the same batch had each lost one of their turkeys. We called it Spontaneous Poultry Death, it happened with the chickens as well. Weak genes were often discussed as a problem with hybrid breeds. When the one turkey died, the other one was understandably distressed, now finding himself alone in his pen, and he flew over the fence and wandered the farm. 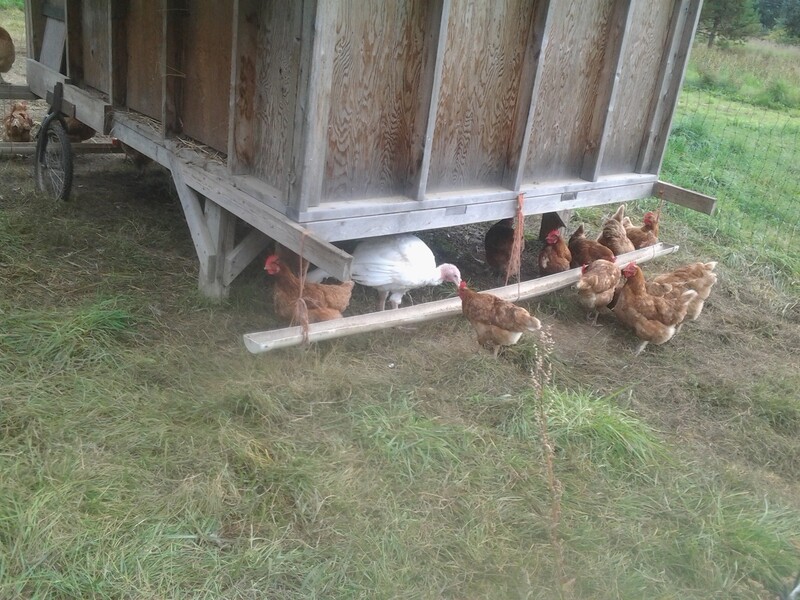 To keep him company, he was put in with our flock of laying hens. The original result was rather like the Pixar short film, For the Birds – like a big, dumb bird trying to make friends with the “cool kids.” But after a few days, everyone got used to their new living situation, and while they didn’t exactly make friends, the chickens got used to the big ugly duckling in their midst, and the turkey started to think he was a chicken. After the horrible part was done, we plucked and prepared the turkey, which was not as bad as I expected, although long and tedious. I can certainly understand how hand preparing poultry is a very long process, and would be terrible if you had a lot to process! 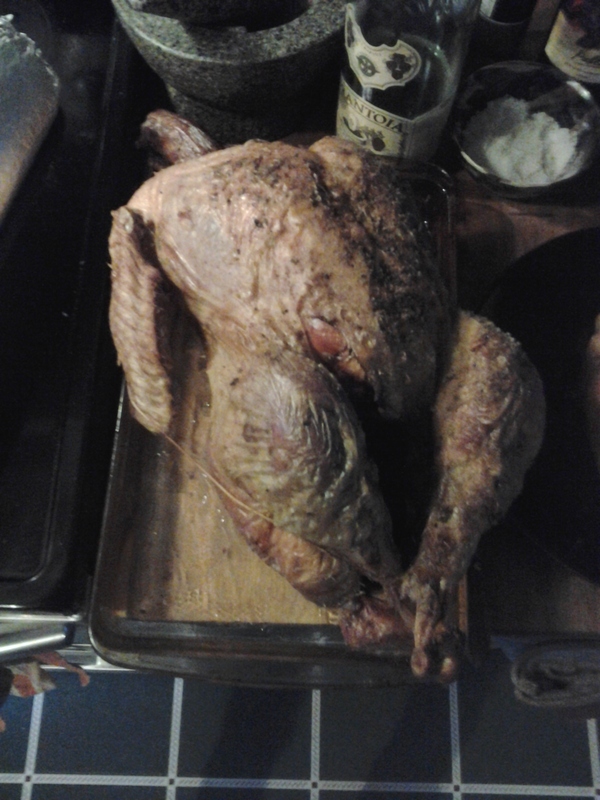 The turkey came in at 14.5lbs. Those many weeks of turkey raising finally brought us to the Thanksgiving dinner table. I left the cooking to more experienced hands. 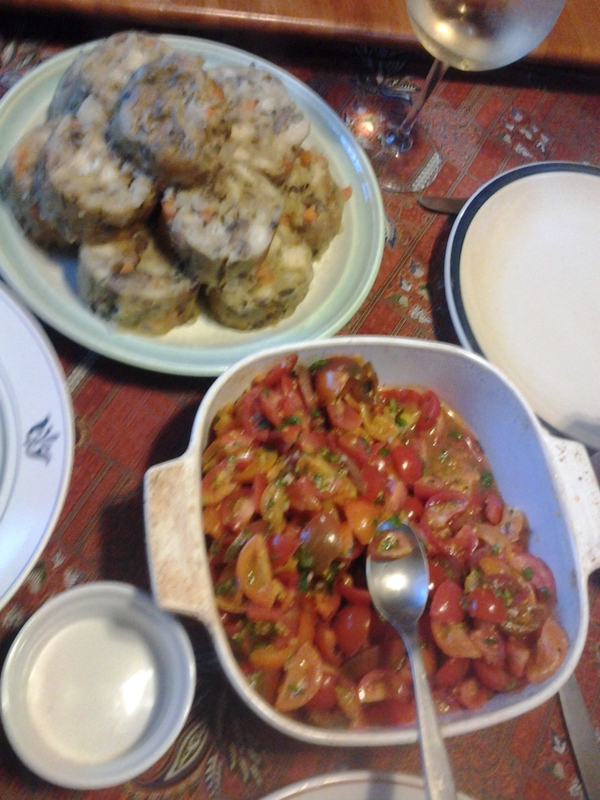 At the end of the day, 8 of us came around the table for a wonderful harvest feast with the bounty of the summer’s work. One day, I would do this again, because my family will always eat turkey for Thanksgiving and Christmas, and I like to know that the animals have been raised in an ethical, humane and environmentally friendly fashion. This was an eye-opening learning experience! 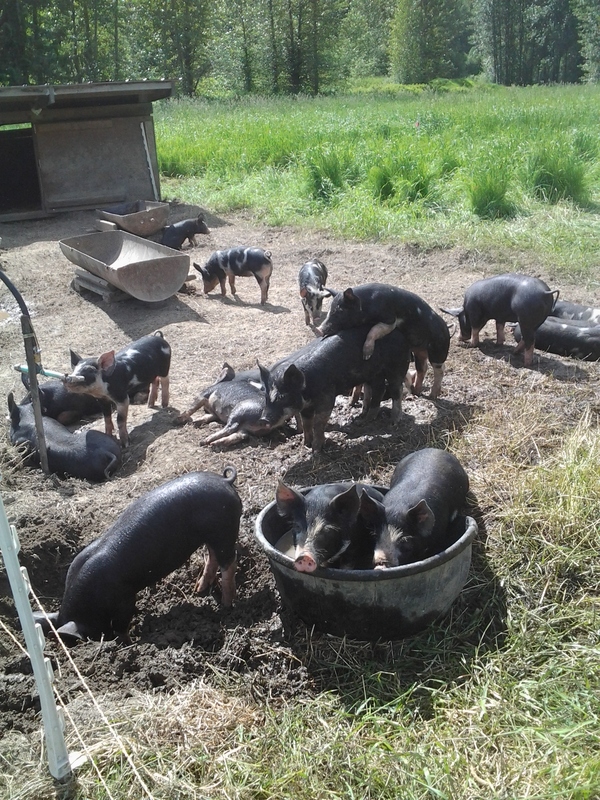 So we’ve been at Rootdown Organic Farm now for a month and a half, learning the ropes of a small scale mixed farm, with about 2.5 acres in cultivation with mixed vegetables, 20 pigs and two lambs being raised for meat, and about 40 laying hens. It has been 6 weeks of growth and adjustment, with my body learning to work much harder than it has ever had to before, living with my wife in a small trailer while also working side by side, dealing with being somewhere a bit remote, though not too much so. It’s been an adventure so far! As mentioned, our quarters on the farm are small but pretty great. 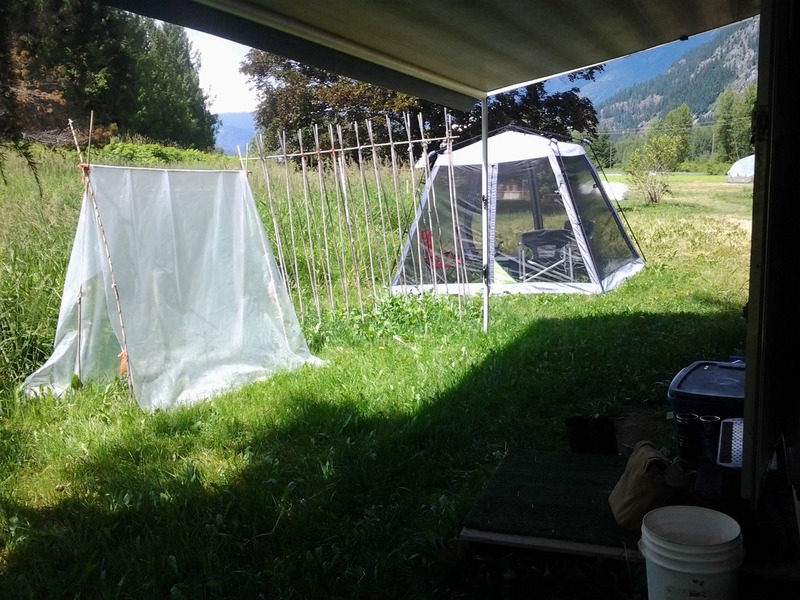 We have a trailer to live in, with an outdoor heated shower and composting toilet, and we’ve made our “yard” fun with the addition of a mosquito net tent (for evening beers), a mini hoophouse for our own tomatoes anhébs, and a trellis for peas. Although it took a bit of adapting at first, I’ve come to love the outdoor shower, with its mountain views. And I’ve always wanted a composting toilet (what a horrible waste of treated water to use it to flush human waste!). The small trailer also took some getting used to, but luckily we spend most of our time outdoors. I’ve been updating the Rootdown farm blog, so most of my updates on the farm are there. But overall, I’ve found that I most enjoy those rewarding tasks like transplanting and harvesting, and I don’t mind weeding too much. I have my favorite crops – broccoli, squash, kale, carrots, beans – that I enjoy dealing with, and some that are my lesser preferred, like salad greens (I totally understand the appeal of growing them for early harvest and high value, but man, they are a lot of work!). We work 5 days a week, and just this week had our first market day. 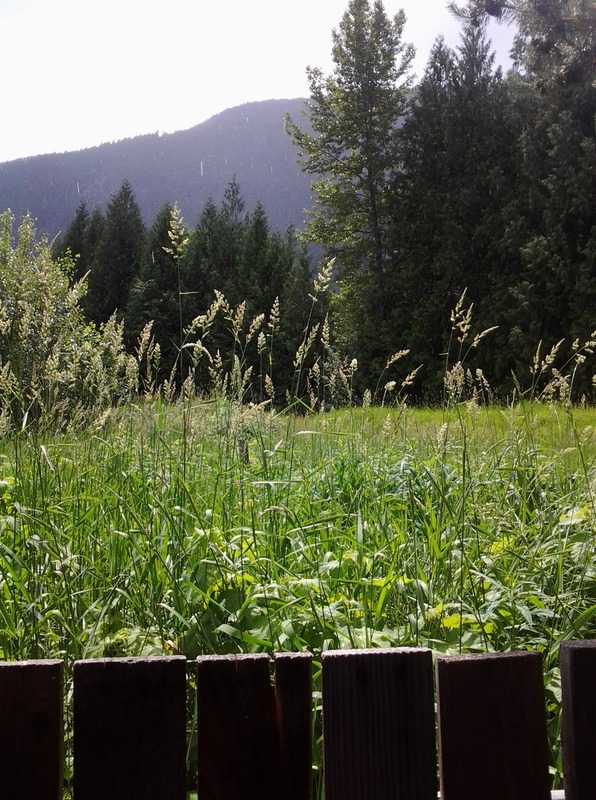 Rootdown attends just one market a week, the Whistler farmers market. Otherwise, we sell to restaurants, grocery stores, and have a CSA that will start at the end of June. These diversified marketing outlets is giving me a chance to see the benefits and drawbacks of each, which will continue as we go through the season. Not unexpectedly, the animals are a highlight for me. Of course, the farm dogs are loveable, but I also find the chickens hilarious and the lambs sweet. Although I’ve been a vegetarian for six years, I expect that will change by the end of this season, because I appreciate that animals and humans have a culinary interdependence, and an animal that has had a good life and an ethical death overall probably has less of an impact on this earth than the tofu and lentils that I eat so much of. But that’s a debate for a different day. For now, I am appreciating the sustenance of the delicious eggs provided by our hens, and acknowledge that while I find the lambs cute and the pigs kind of funny, they will one day be someone’s dinner, if not mine.